Now leveling your coach is easy as ever with the new and improved Ground Control 3.0 4-Point Bolt on kits with wireless remote. 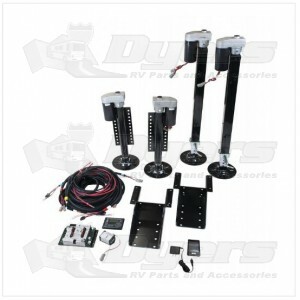 Ground Control® 3.0 is a revolutionary electric leveling system for towable RVs. Its Hitch Recognition Memory Function remembers where the Auto Level sequence was started, saving time during hook-up. Fully Automatic Electric Leveling System LCI has taken its Ground Control® Automatic Electric Leveling System to the next level. Its new leveling jacks are driven by Hall Effect technology, which measures the jack leg motor revolutions instead of amps, ensuring more accurate leveling. We have also added stronger, faster and more stable round rear jacks, a Hitch Recognition Memory Function and a fully automatic wireless option. We are continually offering better options for a better camping experience. - Two times the speed of previous systems. - Hall Effect technology measures revolutions, not amps, ensuring more accurate leveling. - Hitch Recognition Memory Function. - Added stability with new rear round leveling jacks. - Fully automatic one-touch control panel included. - NEW optional one-touch auto-level wireless remote. - Level trailers function more efficiently than non-level trailers. - 20,000 lb. total leveling capacity. - Saves time setting up camp.